Starting your baby on finger foods can be exciting but it can also be an overwhelming and frustrating experience. 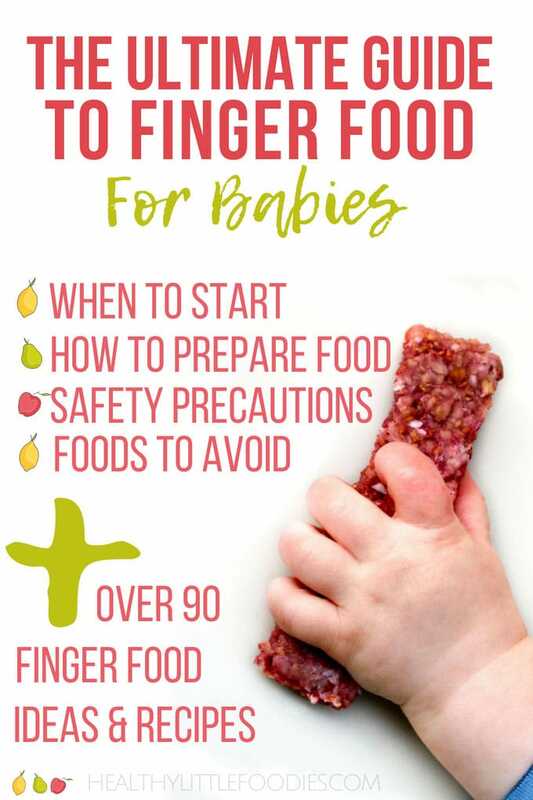 This Guide to Finger Food for Babies not only gives an extensive list of finger food ideas, but it also answers the questions many parents have when it comes to starting finger foods. Of all the messages I receive, by far the most are about finger food for babies. Many parents are nervous about choking, unsure when to start and stuck for ideas. This guide has been a long time coming and has been sitting in my drafts for some time now. Every time I receive an email, asking me about finger foods, I promise myself I will write this resource. Finally, I have completed it! I do feel, however, that this will be a resource that I return to and continually update as I receive new questions and develop new recipes to add to the list. When Should I Start My Baby on Finger Food? When you start your baby on finger food really depends on you, your baby and what method of weaning you have chosen. Followers of Baby-led Weaning introduce finger food at 6 months. Those following the Traditional Weaning approach, usually introduce finger food around 7-8 months. You shouldn’t start finger food before 6 months and your baby should be able to sit up independently and hold their head up. You shouldn’t wait too long to introduce finger food. By one year, your baby should be eating table food, (the food you are eating in age-appropriate textures (shredded, chopped, etc), and self-feeding with assistance as necessary. How many teeth (or lack of teeth) your baby has is not an indication of whether they can handle finger food or not. Gums are unbelievably strong. How to Prepare Finger Food for Babies. You want to offer food that is safe and easy for your baby to pick up and put to their mouth. This will vary depending on the age of your baby. Younger babies, 6-8 months, generally use their whole hand to pick up food, this means they have to close their hand around a piece of food to hold it. The food should be bigger than the palm of their hand as they can’t open their fist to get to it. Long strips of food work best at this age, around 5cm (2 inches). Offering food that is too small can cause frustration. As babies get older, around 8-9 months, they are able to pick up smaller pieces of food, they have usually developed their pincer grasp at this age and use their thumb and forefinger to feed themselves. The texture is also something you need to think about, if the food is too soft it will turn to mush when handled. If too hard they won’t be able to gnaw on it and could be a choking hazard. You can make food easier to grip by leaving the skin on or by using crinkle cutters to add texture (see below picture). Don’t be afraid of spices and herbs, they are a fantastic way to add flavour and it is good to get your babies used to different flavours from a young age. Try different cooking methods, roasting, steaming, sautéing and boiling all can change the texture and way a food tastes. If your baby doesn’t like something steamed, don’t be disheartened, they may love it roasted! Many parents worry and wonder if their children are eating enough. With purees, it is easy to see what has been eaten but it is a little more blurry when it comes to finger foods and you find pieces of food on the floor or down the chair. Let your baby decide how much they want to eat. They will naturally manage their own intake and will stop eating when full. Allow them to feed themselves at their own pace. Offering a well-balanced diet of finger foods will help ensure that your baby is eating the right amount of the right nutritious foods. Make sure your baby is sitting upright to eat and not slumping or lying about. Always ensure eating is done sitting. If you have a mobile baby make sure they are not eating on the run! Never leave your baby alone with food, they should always be supervised. One of the main worries parents have about starting their baby on finger food is choking. Often worries about choking are based on seeing babies gagging on food. Although choking and gagging are related they are not the same thing. It is very common for babies to gag on food. Gagging is triggered when food touches the sensitive area on the tongue or roof of the mouth. The gag reflex is very reactive in babies as the sensitive point is much further forward in the mouth. When a baby gags, food that isn’t ready to be swallowed is pushed forward in a retching movement. Although it can be unsettling to watch, babies generally don’t seem too bothered by it. Choking happens when the airway is partially or fully blocked. When something partially blocks a baby’s airway they will start to cough to clear it. If a baby’s airway is fully blocked and they are truly choking they will be silent as no air can get past the blockage. This is why it is crucial that you never leave your baby alone with food. Read more about choking and what to do here. Whole nuts or large pieces of nuts – Avoid, they can get lodged in a babies windpipe. Popcorn -Avoid, unpopped and half-popped kernels can get caught in your child’s throat and block their airway. Honey – Avoid, honey should never be given to a baby under 12 months. Honey may contain Clostridium botulinum spores which can lead to botulism poisoning. Whole fruits with stones (cherries and larger stone fruits) – Take Care, stones should be removed and fruit should be ripe. Round Fruits – Take Care, round fruits such as grapes and cherry tomatoes should be cut in half lengthways or quartered. Fish – Take care to properly debone. Avoid high mercury fish such as swordfish & king mackerel. Meat – Take care to remove small bones and gristle. Processed foods – Take care and avoid where possible. Processed food often contain sodium levels too high for babies and can be high in sugar. Salt – Take Care and avoid where possible, babies up to 1 yr should have no more 1g of salt 0.4g sodium per day. Do not add salt to foods. Sugar – Take Care and avoid where possible, sugar provides empty calories with no nutrients, it also damages teeth. Hard Foods – Avoid hard foods such as raw carrots and apples as chucks can break off and are a choking hazard. Soften them by cooking. Finger Food for Babies – Ideas. The best way to provide a good range of nutrients for your baby is to offer a varied diet. Having a varied diet will also allow your baby to experience different tastes and textures. Always cut up the food to the size you and your baby are comfortable and have experience with. Fast, healthy food with no cooking required! Vegetables – Most vegetables need some preparation as they are too hard to offer babies raw and can, therefore, be a choking hazard. Cucumber sticks – Served chilled and cut into fingers (great for teething) or diced. Fruit – Most fruit is perfect for babies and requires no cooking. Make sure the fruit is ripe as unripe fruit (like nectarines, pears etc) are hard and can be a choking hazard. Avocado – mash and spread it, cube or cut into strips. 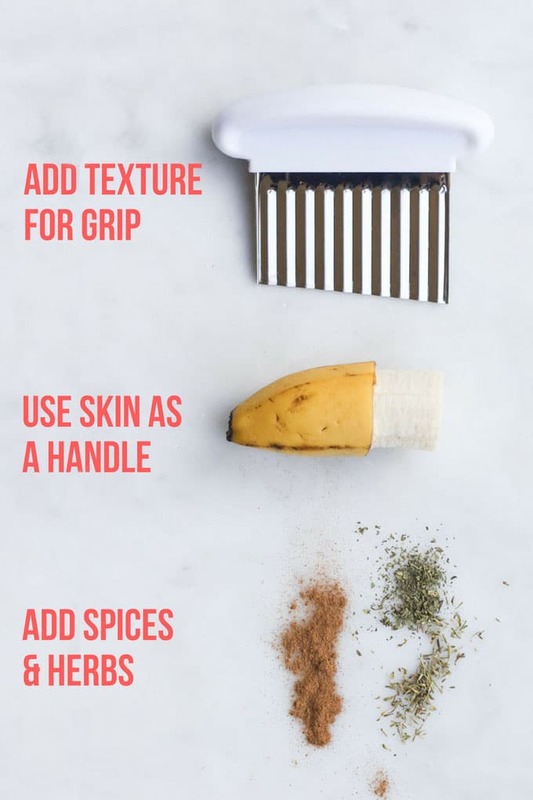 Banana – Thin slices can be slippery and difficult to handle. Break into big chunks or leave some peel on as a “handle”. Berries (blueberries, raspberries, strawberries, blackberries etc) – All great finger foods, squish/half blueberries if they are large. Cherry tomatoes – Cut in half lengthways or into quarters. Grapes – Cut in half lengthways or cut into quarters. Oranges / Clementines / Mandarins – Remove any seeds and cut into small pieces. Pears – Ripe, diced or cut into fingers. Stone Fruit (apricots, cherries, peaches, nectarines, plums etc) – Ripe, stone removed and diced/cut into strips. Tinned Beans – Washed thoroughly, to remove as much salt possible, squish/or cut lengthways. Finger Food for Babies That Require Basic Cooking / Prep. This section is a list of one ingredient foods that need some simple cooking before serving. Experiment with the cooking methods, try cooking with different fats (olive oil/butter) and with different herbs /spices. Vegetables – Most vegetables are perfect for babies if cooked and served in a safe way. Asparagus – Steam/Roast and cut into bite-size pieces. I did baby-led weaning with my second child and gave them to him as spears. Brocolli – Boil/Steam/Roast. Serve in small pieces or florets. Capsicum (Bell Pepper) –Roast in strips and serve in strips or cut into appropriately sized pieces. Egg Plant (Aubergine) – Roast/Sautee chunks. Green Beans –Steam/sautee and cut into small bite-size pieces or strips. Mushrooms – Sautee and serve in small bite size pieces or strips. Parsnip – This was my youngest’s absolute favourite as a baby. Roast and serve in strips / bite-size pieces. Potato – Steam/Boil/Roast. Cut into appropriately sized pieces. Pumpkin – Steam/Boil/Roast. Cut into appropriately sized pieces. Squash – Steam/Boil/Roast. Cut into appropriately sized pieces. Sweetcorn – Boil/ Steam/Grill. Serve on the cob in small sections (see above picture) or individual kernels. Sweet Potato – Boil/Steam/Roast. Serve as fries, wedges or small bite-size pieces. Turnip – Boil/Steam/Roast. Cut into appropriately sized pieces. Zucchini (Courgette) – Steam/Sautee/Roast. Cut into fingers / bite-size pieces. Fruit – Most fruit is safe to serve raw but cook harder fruits to soften them. Apple – Baked or sauteed until soft. Cut into appropriately sized pieces. Pears – Baked or sauteed like above apple recipe. Cut into appropriately sized pieces. Chicken – All cuts, baked/pan-fried/poached, shredded or diced into small pieces. Thigh meat is less dry and was favoured more by my kids when they were younger. Couscous – Boil, clump and squish into a ball. Eggs – scrambled, hard-boiled, omelet. Cut into appropriately sized pieces. Ground Meat (beef, chicken, pork, lamb or turkey) Sauteed until fully cooked, add in herbs and spices for extra flavour. Israeli Couscous – Boil and serve. Larger than regular couscous, my kids love it! Lentils – Boil, drain and serve. Pasta – Boil, cook and serve plain or with a sauce. Prawns / Shrimp – Peeled and deveined and fully cooked. Cut into appropriately sized pieces. Quinoa – Boil. I find quinoa harder to clump into balls but adding some grated cheese can help it stick together better. These are great recipes that both my boys loved as babies (and still do now!). Cut them up into the size your baby has experience with. I receive a lot of e-mails from parents who have babies with allergies. Next to each recipe, I have detailed if it is Dairy Free (DF), Egg Free (EF), Gluten Free (GF) and Nut Free (NF). 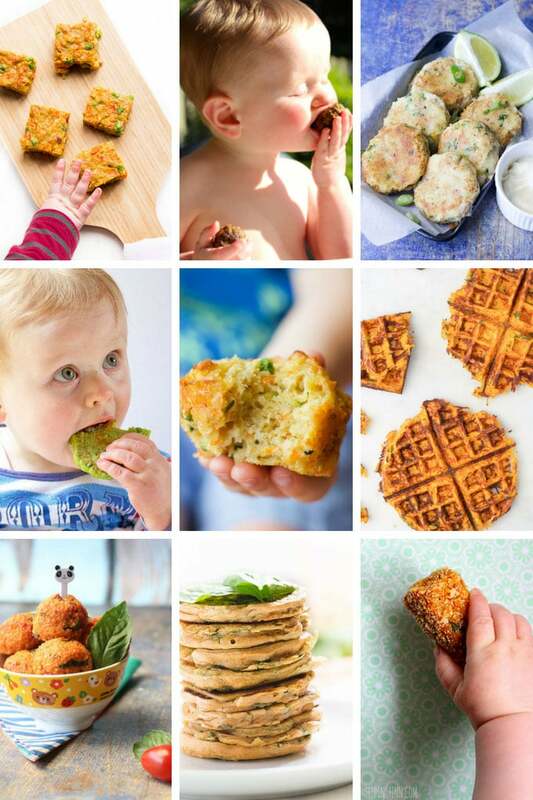 Savoury Pancakes/ Waffles / Muffins – Easy for babies to pick up and great for packing into lunchboxes for out and about. Eggs – Delicious, easy to pick up egg recipes. Oats – These recipes are great for breakfast or as a sweet snack and they can all be frozen. Pancakes – Great for little hands, why not try these variations. 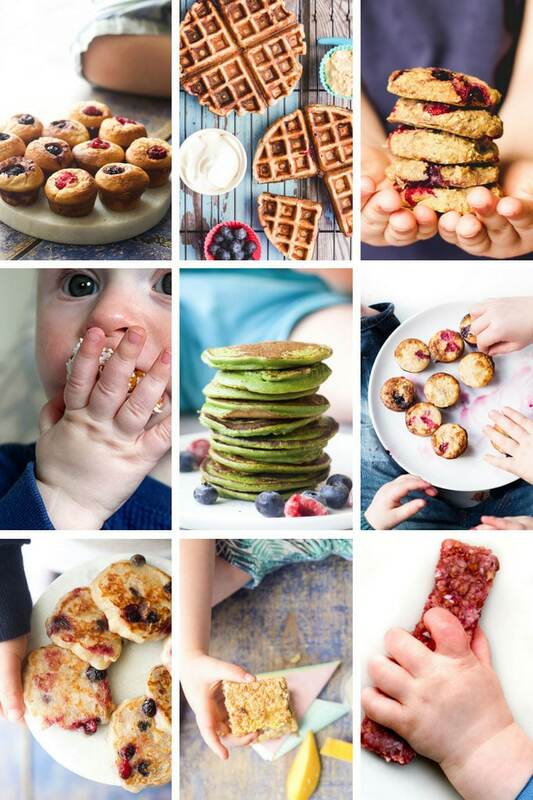 Muffins and Cookies – These recipes are sweetened only with fruit, making them great for babies. Frozen Recipies – Allow your baby to experience different textures, flavours, and temperatures. Warning – will get messy! There are so many snacks and finger food for babies and toddlers available on the market. I rarely ever bought them as I never saw the need to. Always look at the back of the packaging, at the ingredient list. Marketers are very clever at convincing us that something is healthy when it is not. 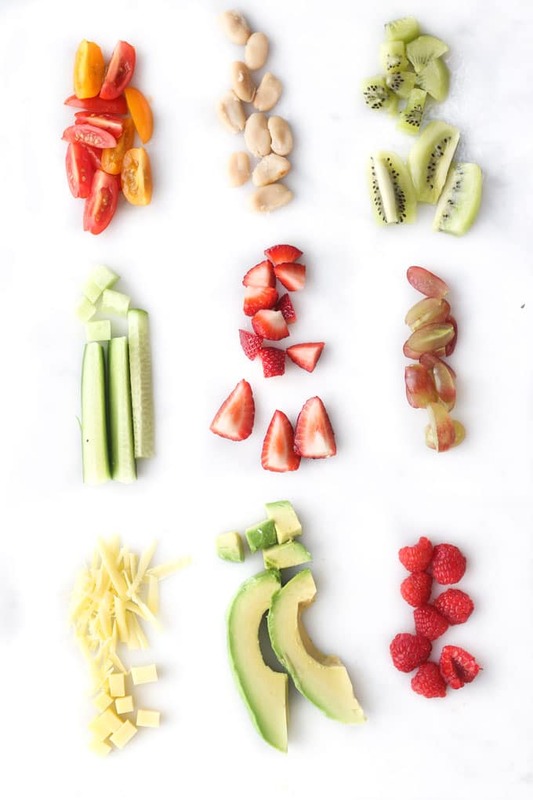 Fresh ripe fruit is perfect for out and about and many of the above recipes can be frozen and are easy to take out and about. Do you still have questions? Leave any queries you have below and hopefully, they can be answered. Disclaimer: This information is intended for general use only. It is not medical advice and is not intended to replace the personalised care and advice given to you by your health professional. I am not a health professional and I do not know your baby. You should always discuss any concerns or questions about the health and well being of your baby, including Baby-Led Weaning and starting solids, with a healthcare professional. Please refer to my full disclaimer for more info. Can you feed them the fruit out of a fruit cup, like the Dole brand, when doing BLW? Hi Janett, I have never bought fruit cups before. Are they fruit stored in syrup? If this is the case then, personally, I wouldn’t recommend serving it to a baby due to the added sugars. Thanks for such a fantastic list of ideas! I was using the same 6/7 vegetable combinations every day so it’s nice to get some ideas for variety. Love the recipes too. 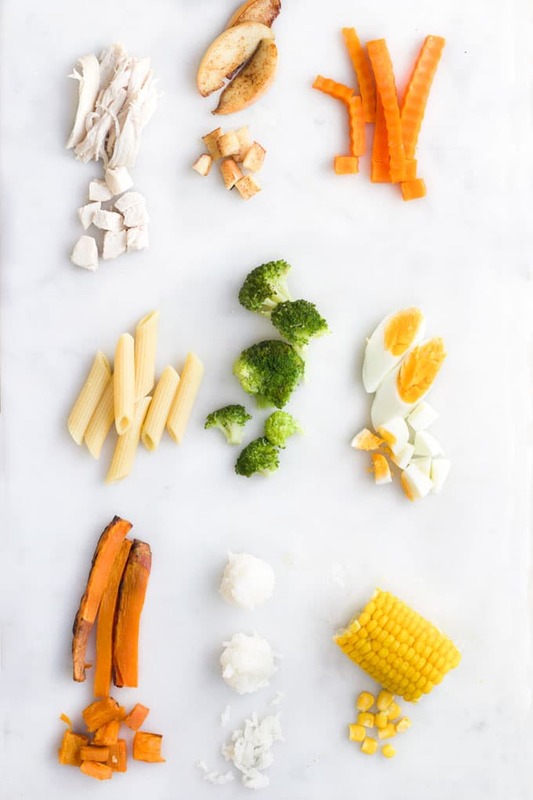 Such a useful article and so many new ideas of what I can give my baby, but just a quick question am I okay cooking the carrots the night before to give as a snack the following day cold or do they need to be given immediately after cooking?